I am bulking up on nonfiction picture books as a way to get my students more interested/less intimidated by this genre. Neighborhood Sharks is the gold standard in my classroom. I keep trying to meet it, and while Jude Isabella's The Red Bicycle doesn't quite get there, the students will enjoy it. 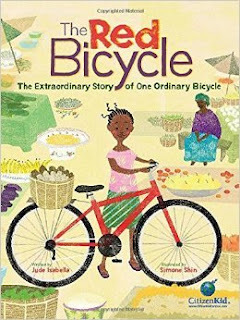 As the subtitle says, this is the "extraordinary story of one ordinary bicycle." Big Red starts its life in North America, when a boy saves up to buy his own bike. After many happy years together, the boy outgrows Big Red and decides to donate it. The bike travels across the Atlantic to Burkina Faso, and its adventures continue. As a newly minted social studies teacher, I love that there are so many connections that I can make. Whenever we discuss a new place, the students put a pin in our map. This is a great opportunity to talk about Burkina Faso and what life is like there. I learned a lot, too! It's really important that nonfiction texts don't feel like work. This is an excellent mentor text because it is narrative nonfiction; readers get caught up in the story and realize that nonfiction doesn't have to sound like a boring textbook. Gold standard?? I'm blushing! That makes my day! Thank you so much for your enthusiasm for my book, and for your commitment to introducing your kids to nonfiction. There's so much great stuff out there, with more every year. Best wishes!